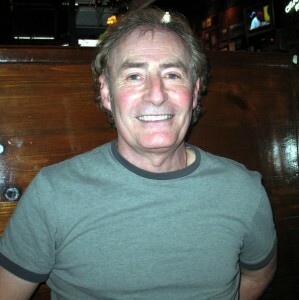 Jimmy Kelly Stateside at the age of 56. It was Bill McGarry who played as big a part as anyone in paving the way for Jimmy Kelly to spend the best part of his life in the American state of Oregon. The formidable Wolves manager called in the then 20-year-old winger to tell him he needed to become more big-headed and confident about his undoubted abilities. And so Kelly spent the summer of 1974 playing alongside Peter Withe, Barry Powell, Don Gardner and Chris Dangerfield for Portland Timbers, quickly realising that Oregon’s largest city is one heck of a place. Some 30 years ago, the tricky little left-winger bade farewell to his English career to settle permanently in the Pacific North West. It’s quite a hike from Aldergrove, Northern Ireland, where he first drew breath in 1954. “There was a church and a bar called Kelly’s (no relation) and that’s about it,” he says. He played at St Joseph’s Primary School and then the secondary St Aidan’s, where the lads themselves started the football programme, only the Gaelic version having previously been on offer. Young Jimmy joined Glentoran but three months later switched to Cliftonville, where he stayed for a year and a half, featuring as a regular in the first team and getting into the Northern Ireland Youth side. Inevitably, he attracted scouts, in his case from clubs like Celtic and Chelsea. 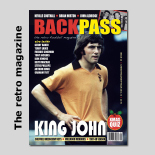 He stuck the pace at Molineux, though, after signing professional forms in December, 1971. He soon became a fixture in the Central League side but did not have the same swagger or self-assuredness of other young players; hence McGarry’s determination that he should get some exposure in the USA. 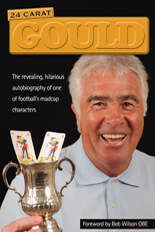 Wolves lost 1-0 at Bramall Lane a month before their League Cup final clash with Manchester City and it was more than two years before Kelly had a second bite of the cherry, ironically back at Sheffield United in March, 1976, after a loan spell at Wrexham. 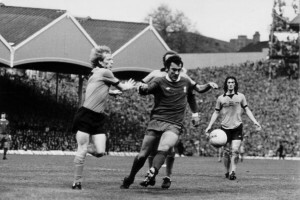 Watched by Kenny Hibbitt, Willie Carr and Mike Bailey challenge Ray Kennedy in the Wolves v Liverpool cliffhanger in 1976. In the distance on the left is Jimmy Kelly's marker, Tommy Smith. Kelly stayed in the team for all bar one game for the rest of the season and was in the no 11 shirt for that game at Molineux against Liverpool in which Wolves’ relegation fate was sealed and the Reds lifted the championship. Tommy Smith proved a predictably sizeable obstacle to the tricky winger. 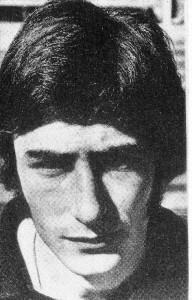 The Irishman barely got a look-in during the Second Division season that followed, although he again figured home and away against Sheffield United, but in 1977-78 made the last ten appearances of the 23 he totalled for the club before making the short move to Fellows Park. Kelly leapt at the chance when Vic Crowe urged him to return to Portland, where he played alongside the likes of Keith MacRae (Manchester City’s keeper against Wolves at Wembley in 1974), Clyde Best, John Platt, Clive Charles and Willie Donachie. When his playing career wound down, he coached youngsters before going into the plastics business. “As a lad, I had been in a training centre in Belfast learning relevant skills – it was in a part of the city where bullets would be hitting the school walls while we studied!” he added. But his learning was put to good use. Since 1996, he has run his own company, Waterford Plastics in Oregon, making displays for hospitals and holders for beef jerky! And he still looks back nostalgically to his formative years in Wolverhampton. “It’s strange, you know. When I watch the Wolves on television now, these random memories crop up. Like how Jack Dowen would tell Steve Daley off every day. Like how the Scottish and Irish lads would play the English at five-a-side and how one day I nutmegged Eddie Gould – something he didn’t take too kindly to! I don’t remember much about the next few minutes! “Danny Hegan was different. He would say he was going to nutmeg you and then do exactly that. Posted on: Wednesday, May 19th, 2010.